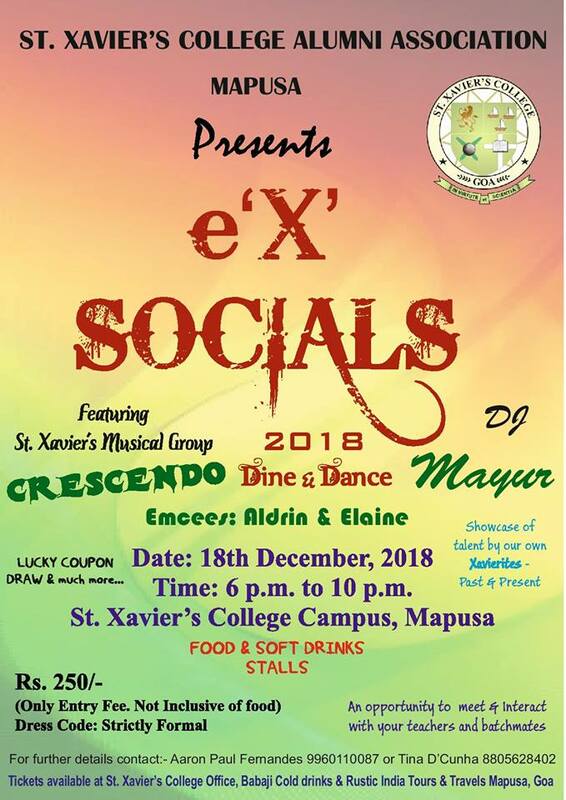 St. Xavier’s Alumni Association, Mapusa presents e ‘X’ Socials 2018 a Dine & Dance on 18th December 2018 at St. Xavier’s College, Mapusa from 6 pm to 10 pm. This is an annual event since last year providing an opportunity for alumni to visit the campus again to meet and interact with their batch mates, teachers and so on. The event will also witness musical talent from our very own Xavierites. Tickets are available at the College Office, Babaji Coldrinks, and Rustic India Tours & Travels, Mapusa.